Dark Physics & Dark A.I. & Dark Dynamix / Boned ragdoll example - try it! I have attached an exe for you to play with. You can also use the mouse cursor to throw the character around. Great work mate. Joint constraints all seemed to make sense (I remember Dark Physics joint constraints not working on rag dolls), and it all looked pretty sweet. I spent my time hitting the rag doll button then quickly dragging some force onto a limb to simulate a gun shot. Looks great! My only question is, will we have control over how quickly the ragdoll sleeps? After he was pretty much stationary, he carried on jiggling and never stopped. Looks awesome though. Looking forward to trying this. Quote: "My only question is, will we have control over how quickly the ragdoll sleeps? After he was pretty much stationary, he carried on jiggling and never stopped. " I have only seen that happen on very few occasions, you can limit this on set up, I thought I had a good balance but perhaps it could be improved. You can put it to sleep at any time. Quote: "I have only seen that happen on very few occasions, you can limit this on set up, I thought I had a good balance but perhaps it could be improved." It wouldn't surprise me if it was fine on your machine and jiggly on mine, such is the randomness of physics simulations. I'd probably just loop through all the limbs and check their angular/linear speeds, and when they were low enough, sleep it. So as long as there is a sleep command, I can't see any problem. Works fine here. Sometimes it jitters, but usually it comes to a full stop quite fast. I like it. The rag doll seems to stiffen up on the last animation frame. I'm sure we will be able to make the bones loosen up to fall with gravity, right? In this example I create the joints just before it goes into a ragdoll and I don't give a lot of flexibility in the joints. This has the effect of the character seeming to keep the pose he was in but go limp at the same time, I quite like this effect although it was done like this to save time. There is an unlimited amount of ways to set the joints up so almost anything is possible. Did you know that water is wet? - "The more you know"
1) I can not do the mouse pick. I left and right clicked on the ragdoll and I can't grab it. I even put the example in exclusive fullscreen mode and it didn't work. 2) When I Press 'space' for debug, the soldier model just simply disappears, but comes back when I release the space bar. I'm running on Vista 64Bit - GeForce GTX 560 Ti with latest 301.42 drivers. 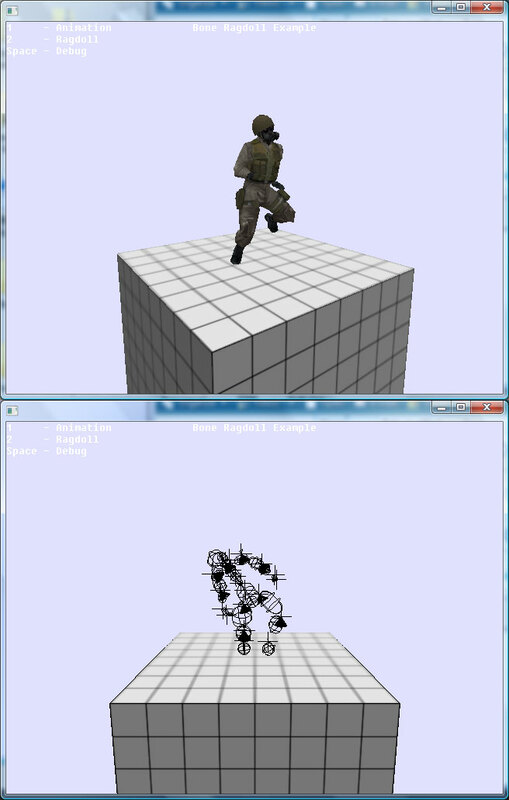 EDIT: NM, I had to also include the PhysX Constants File also (ie: I had to make my own boned ragdoll project, so I didn't know ). It works now.